KoopaTV: The NeoGAF Liberation! Right or Wrong, NeoGAF is Ruined! 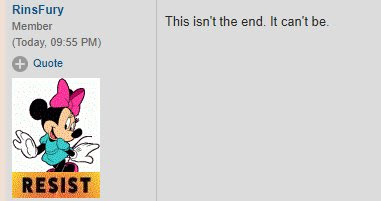 By LUDWIG VON KOOPA - Against my better judgment, I'm going to assume NeoGAF has no viable future as NeoGAF. Once again, radical left-wing videogame forum NeoGAF is in the news. Unlike the last time we discussed NeoGAF on KoopaTV (back in March with regards to Yooka-Laylee), the losing party of the news story is not a gaming company or a game, but it is actually NeoGAF itself. Awesome! If you try to access NeoGAF right now (going there is never recommended), then you are greeted not with an awful, over-orderly fascist forum, but by a warm 503 Service Unavailable error. But this is not scheduled maintenance. It is, in fact, NeoGAF imploding for this reason — NeoGAF owner, Tyler Malka (otherwise known as Evilore), has been accused of sexually harassing some woman who posted her accusation on Facebook. That caused a chain reaction where the moderators of the forum, the ones that clamped so hard to destroy freedom of thought, ditched their moderation positions and took the site down for “scheduled maintenance.” Now NeoGAF members, many of which used NeoGAF for everything (it was, after all, an echo chamber) relating to news, knowledge, and creative pursuits, are struggling to figure out what else to do with their lives. Take my issues with change management and then multiply that to cover the population of one of the biggest gaming forums on the Internet, and you get some sweet, sweet chaos. This chaos brought to you by the collapse of NeoGAF's careful moderation. It's pretty much like if Kim Jong Un flew off in a rocket to the Moon tomorrow and then watching what would happen to the North Korean regime, an isolated place that has no connection with the outside world. Yes, they're FREE AT LAST from their regime's thought-slavery, but how will these radical “progressives” integrate with the real world they shunned and were intolerant of for so long? A world where... GASP... not everyone thinks like them? Their minds may explode. I think you can tell that I have nothing but disdain for NeoGAF. However, let's go back a couple of paragraphs as to why this is happening. This isn't an ideological victory against NeoGAF's awful philosophies. This is a guilty-until-proven-otherwise claim against the site's owner. The sexual harassment claim is not proven. It is an accusation. Just because I dislike NeoGAF does not mean I am going to turn away from my innocent-until-proven-guilty philosophies. NeoGAF itself may be a corrupt place that does not believe in innocent-until-proven-guilty (both in terms of its own moderation policies, and how they view the world in general) viewpoints, but I'm not interested in scoring cheap political points by mocking them as hypocrites. (...Okay, I AM interested in that, but...) It's a classic tactic to throw a sexual harassment claim at a guy to try to ruin a movement. They do that with every black conservative in politics. They did that with President Donald John Trump. Perhaps that's what happened with Evilore? ...I don't know, I'm just going off the presumption of his innocence, even if he is a detestable guy. This person might even be innocent, too! I'm going to be consistent. NeoGAF's moderators ditched the site because they were afraid of the backlash against their own reputations, not because this sort of thing is new news. The userbase is divided between people who were engaging in account-suicide to people who were just bewildered, to people who want to wait and see what happens... to people who don't know what's even going on, since they were deleting all references to the accusations. KoopaTV is also not a tabloid going into people's personal lives. (...Besides those times where it was, but we don't talk about those.) I don't know what Evilore does with women, and I don't care. I care about defeating NeoGAF's ideology, not its messengers. NeoGAF is like ISIS: You can kill a Jihadist leader or two, but anyone can start their own terrorist group and quickly gain influence after being influenced by its awful ideology. You cut off its head, and it slithers back in another form. It'd be great if NeoGAF was dead and stayed that way, but there's more that needs to be done than just give the site a 503 error. We need to stay alert. The mission is not yet accomplished. In the span of this article, they have moved from a 503 error to a 502 error. ...I don't know if lower or higher numbers get you closer to going back up. Gotta stay alert! KoopaTV has absolutely no succession plan. That means if Ludwig gets stomped on by Mario harder than usual and can't come back during the post-game credits like nothing happened, or perhaps he gets the Zika virus or falls victim to a new form of bioterrorism, the rest of the staff will have no idea what to do and KoopaTV will probably end right there. Since KoopaTV is the only site of its kind to articulate the ideas you can read on the over twelve-hundred KoopaTV articles currently in existence, then if you killed off its leader that would be the end of its ideology. ...Not to give you any ideas. This story has some parallels to NeoGAF fanboy and KoopaTV enemy Chrom, and how he lost his forum NSider2 and recreated it as the lesser-off Ninfora. Can't even begin to tell you how happy the downfall of NEOgaf makes me. "NeoGAF will be back online shortly." It's been that way for a couple of hours now. I just want to know if I'm unbanned from it like I was unbanned from NSider2 after Chrom got ejected! A Hat in Time did not kick off JonTron. I am sure NeoGAF tried to pressure the developers to remove his voice there but the developers did not listen. Accusing men of a certain crime and it being false only harms actual victims in the end. Oh. Yes. Yes they did try. Evilore insists that it's totally false and the accuser has mental illnesses. And that he had witnesses and evidence. I remember reading a few discussions on there through the search engine although they did not have anything to do with politics. Reddit has been my go to discussion board for gaming because at least there you can filter your subscriptions and block out anything political if you so desire. NeoGAF has been resurrected and temporarily has removed the Off-Topic half of the site, leaving only the Gaming half. That's... forcibly blocking out anything political, for now.